Contract I subway (IRT East Side Line) at 14th Street/Union Square on the station's 107th anniversary of opening. Photo by: Zach Summer, October 27, 2011. The IRT line on the East Side of Manhattan is made up of portions of several different subway construction contracts, including the 1904 Contract I "First Subway" from City Hall to 33rd Street, three 1905 Contract II Brooklyn Extension stations, and, from Grand Central northward, eleven 1918 Contract III, or "Dual Contracts" stations. The Contract I and Dual Contracts construction is covered in-depth elsewhere on this site (The First Subway and The Dual Contracts), so this overview will consist of a few brief notes. Section 1, Ann Street north to the center of Chambers Street, 0.5 miles of route including the City Hall station and loop, and Brooklyn Bridge station. The work included two tail tracks in a two track structure ending just north of Ann Street, for the switching back of express trains, and two tail tracks and the City Hall loop for layup and turnback of the local trains. The "express" tail tracks would be later used to connect the Contract II Brooklyn Extension subway work from Broadway. 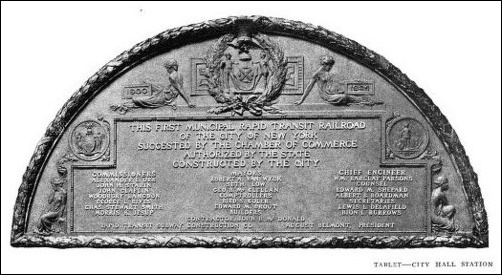 The Contract I subway's groundbreaking took place at City Hall on March 24, 1900 but actual construction on this segment didn't start until March, 1901. 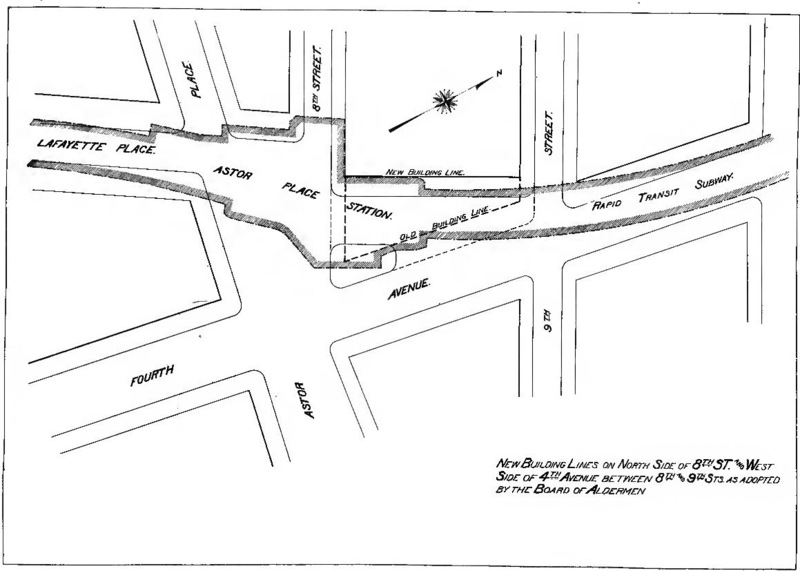 Section 2, Center of Chambers Street north to the center of Great Jones Street, a four track subway running 1.13 miles under Elm Street (today's Lafayette Street). Cut and cover construction. Stations included: Worth Street (now closed), Canal Street, Spring Street, and Bleecker Street. At Spring Street there was a center siding track making the width of the subway at this point five tracks. Construction commenced July 10, 1900, and encountered some trouble near Pearl Street at the site of the old filled-in Collect Pond. Section 3, Center of Great Jones Street north to approximately 34th Street, a four track subway running 1.5 miles under Elm Street (Lafayette Street), Fourth Avenue, and today's Park Avenue South and Park Avenue. Cut and cover construction. Stations located at: Astor Place, 14th Street (express), 18th Street (now closed), 23rd Street, 28th Street, and 33rd Street. Construction commenced July 12, 1900. Section 4, Two separate deep rock tunnels from 33rd Street to East 41st Street, 0.38 miles of four track subway under today's Park Avenue. 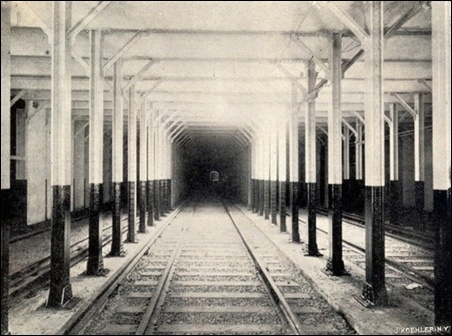 The two separate tunnels were required to avoid the existing street railway tunnel, built in 1850 for the New York and Harlem Railroad Company. Section 5 included work taking the First Subway westward under 42nd Street to its Grand Central station (today's Shuttle station). On August 1, 1918, it was at this point that the new Dual Contracts "Lexington Avenue Subway" was connected to the Contract I subway. Some complex tunneling work was required to build the connection without interrupting existing service. 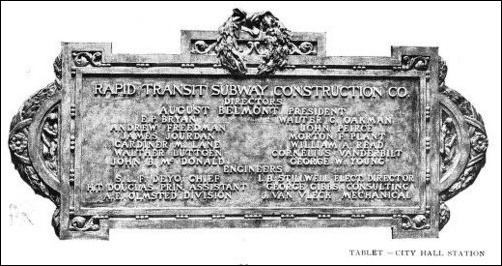 Several articles describe this work, including Design of the Diagonal Station and Connection (1918), and Opening a New Link of New York's Vast Subway System (1918). Two more articles describe the August 1, 1918 service changes that would become known as the "H System": IRT H System Opens (1918), and The H Lines In Service (1918). The Lexington Avenue subway line was known as Dual Contracts Route No. 5, and the work to the Harlem River was divided into seven subsections. Stations included: the new "Diagonal Station" mentioned above at Grand Central (express), 51st Street, 59th Street, 68th Street, 77th Street, 86th Street (express), 96th Street, 103rd Street, 110th Street, 116th Street, 125th Street (express). The subway was to be four tracks on two levels, with local service on the upper level and express service on the lower level, and included a complex junction at 125th Street to connect to the lines being built in the Bronx. 59th Street was later converted to an express station, with new side platforms built on the lower level. "View of the Tunnel, the Subway, N.Y.". Postcard view of a five-track portion of the subway (Spring Street). Postcard view of a typical station on the Contract I subway. Section 1, from the intersection of Broadway and Park Row to Bowling Green, a 2-track subway with side platform stations at Fulton Street and Wall Street, and an island platform station at Bowling Green. 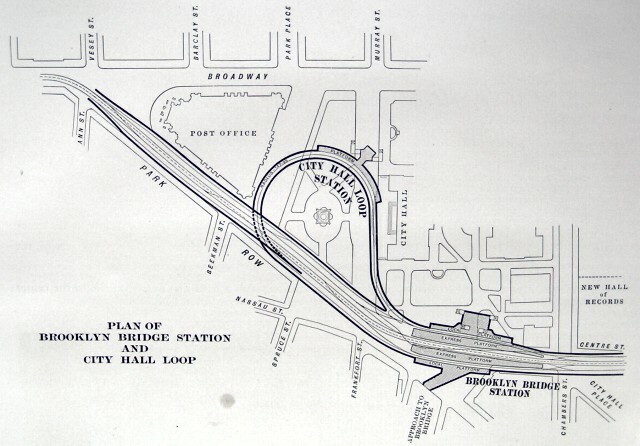 Section 2, the so-called "Battery Loop", a two track loop around Battery Park including a station with a single side platform at South Ferry. This loop and station would later become part of the IRT West Side line opened in 1918. Section 2 also included the two tracks south of Bowling Green that lead to the Joralemon Street tunnel to Brooklyn. The East Side subway is connected to the IRT Brooklyn Line at the south end, at the north end primarily to the Dual Contracts-era IRT Pelham Line and IRT Woodlawn Line. A connection was also built to the Contract I Bronx line running to White Plains Road. South Ferry station was originally built as part of the IRT East Side Line's Brooklyn Extension, but now is served only by West Side trains, so the description is located there. Bowling Green station serves the express trains from the IRT East Side line heading to/from Brooklyn. The station layout is unusual; it has a full length island platform, a side platform slightly offset on the eastern (northbound) side, and a quarter-length island platform on the western (southbound) side. Only the island platform is original construction, the rest were added later. Now, northbound trains open their doors on the right side of the train, onto the eastern side platform; southbound trains open their doors on the left side of the train onto the island platform. A railing runs the length of the island platform along the northbound track face. The short southbound-side platform is abandoned; so one could consider the station now having two tracks and two side platforms. The diagram below will more clearly illustrate the platform arrangement. 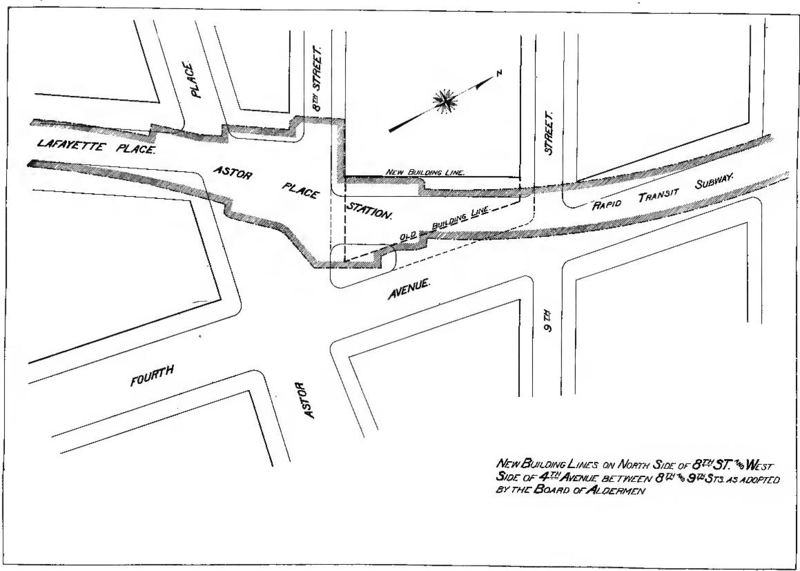 South of Bowling Green, the Battery Loop consisted of one main track (connecting the downtown side of Bowling Green to the uptown side); one station on this loop track (South Ferry, with a single side platform on the outside of the loop), and a second inner loop track used for layups, storage, disabled trains, etc., and provision for the two main tracks to pass under the loop to Brooklyn. In January, 1908, the tunnel to Brooklyn opened, and the initial service pattern had some express trains running to Borough Hall and some terminating at South Ferry via the Battery Loop. Demand for Brooklyn service was immediately higher than this service pattern permitted and it was necessary to run all rush hour trains through to Borough Hall. So, to provide rush hour service to South Ferry, construction started February 23, 1909 on the strange, short side platform on the west side of the Bowling Green station, and a new trackway connecting into the Battery Loop. Completed in April, 1909, shuttles then provided all rush hour service to South Ferry using this short platform. Off-peak trains continued to circle the South Ferry loop (and still do, although the terminating trains from the East Side line use the inner track and do not stop at South Ferry). In 1918, the completion of the IRT West Side line from Times Square to South Ferry created a second connection into the Battery Loop. The West Side service began using the South Ferry station as its southern terminal. To continue providing the shuttle service, South Ferry had a second platform face added on the inside of the loop along the second track (the one formerly used only to turn or layup trains mentioned above.) The tracks are arranged so that the shuttle train enters and South Ferry Inner and returns in the same direction from which it came, without fouling the West Side service on the outer track. The shuttle operation was discontinued in 1977 due to budget cuts, yet the platform and wall were renovated anyway in 1978. The 1978 renovation covered over original Heins & LaFarge mosaic "tapestries" that were along the side walls. One more piece of Bowling Green requires explanation, the side platform on the eastern (northbound) side. This was built as part of the 1970s renovations, due to high passenger volume on the island platform. Additional exits were required from the island platform; building the side platform allowed for an underpass to be built, with exits to the street from the side platform. This funneled some of the traffic away from the headhouse exit at the south end. The fare control now consists of the restored headhouse entrance at the south end, which serves only the island platform, and various other entrances that lead to the eastern side platform and down to a large fare control gate area in the underpass. Two tracks, two side platforms slightly offset from each other, with glossy blue tile over the original white. The standard IRT name tablet mosaics have been preserved and incorporated into the blue tile; fancy ceiling accents have been preserved as well. 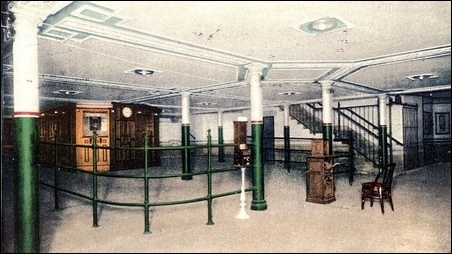 On the southbound platform is a wooden token booth and a ticket chopper, wooden restroom doors on each side, and a mosaic of the "wall" is on the rear wall. There is a crossunder about midway along the length of the stations, and a lesser-used one at the north end. At street level are faux kiosks on the southbound side. Exits are located at Broadway at Thames Street, and Broadway between Rector and Exchange Place. A long underground passageway exists outside the fare control which connects to the Broad Street station of the BMT Nassau Street-Jamaica Line. This passageway also leads to Chase Manhattan Plaza and and the old Equitable Building. Artwork Lariat Seat Loops, James Garvey. Also at 33rd Street (see below). Fulton Street is a local station with two tracks and two side platforms, under Broadway between Fulton Street (north) and Cortlandt Street (south). This is the first station of the IRT Brooklyn Extension program, which opened a few months after the IRT Main Line north of City Hall, and the first subway station to reach as far south in Manhattan as Fulton Street. The station has many ornate decorative elements, including a plaque depicting the steamboat built by Robert Fulton, fancy terra-cotta "F" plaques with greek frets, marble panels, and mosaic name tablets. The southbound platform also incorporates an ornate entrance to 195 Broadway which features fluted columns, engraved metal signs, ornate railings, and some blacked-out display windows. This station is now a registered New York City landmark. There are exits at Fulton Street and Dey Street on the southbound side, and Fulton Street and John Street on the northbound side. The transfer corridor to the other Fulton Street stations and the new Fulton Street Transit Center headhouse runs easterly from here under Fulton Street. Present-day diagram of the Brooklyn Bridge and City Hall loop and station elevations. Click to enlarge. 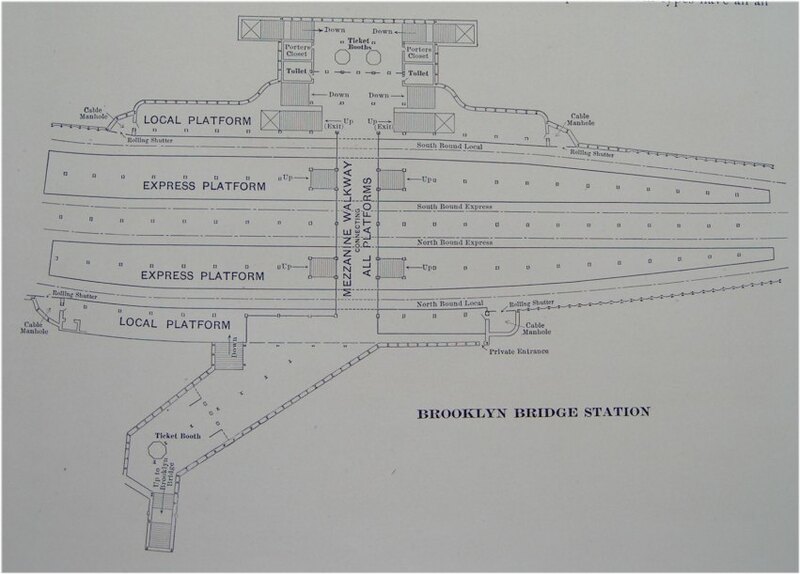 Detailed construction plan of the Brooklyn Bridge station as originally built, from the book The New York Subway: Its Construction and Equipment. Another diagram of the Brooklyn Bridge and City Hall loop and station elevations. Click to enlarge. Express station with four tracks and two island platforms in use, two side platforms abandoned. The station has been recently renovated, with new tile (poorly approximating original IRT tile) and ADA-compliant elevator access. Brooklyn Bridge/City Hall station is the southern terminal of the East Side IRT local service, assuming this role from the City Hall Loop station in 1945. South of the station, the downtown local track splits into three tracks. The right-most leads into the City Hall Loop (and thence returns to the uptown side of this station). The other two are layup tracks parallel to the downtown express track. Until the 1960s they merged into the downtown express track north of Fulton Street station but since then they are spurs ending a little ways north of Fulton St. Trains are occasionally stored there. The Brooklyn Bridge station has a number of abandoned areas as construction and service patterns have required changes to be made to the station. In addition to the two existing island platforms, there are two short local platforms on the outer edges of the station. These local platforms were built to the 5-car length of original IRT local trains presumably to accommodate extra passenger volume. (Similar platforms were built at the express stations at 14th Street and 96th Street.) These side platforms did not see much use as they were located at express stations that required transfer via the island platforms, and, as the trains were lengthened to their current 10-car length it was impractical to lengthen both these small side platforms and the island platforms. They were closed in 1910 after only six years in operation and walled off along the platform edges. The side platform on the southbound is now home to some electrical equipment and a backup control tower for the Brooklyn Bridge interlocking. This tower is functional but not normally used, because the Grand Central tower is the primary control point for the whole line. The interlocking board can be seen through a window along the wall along the southbound local trackway. The south end of the downtown side platform is still visible near the dispatcher's booth on the downtown island platform. There are also some closed portions at the south ends of the existing express platforms. During the station lengthening projects it was easier to lengthen the express platforms to the north. 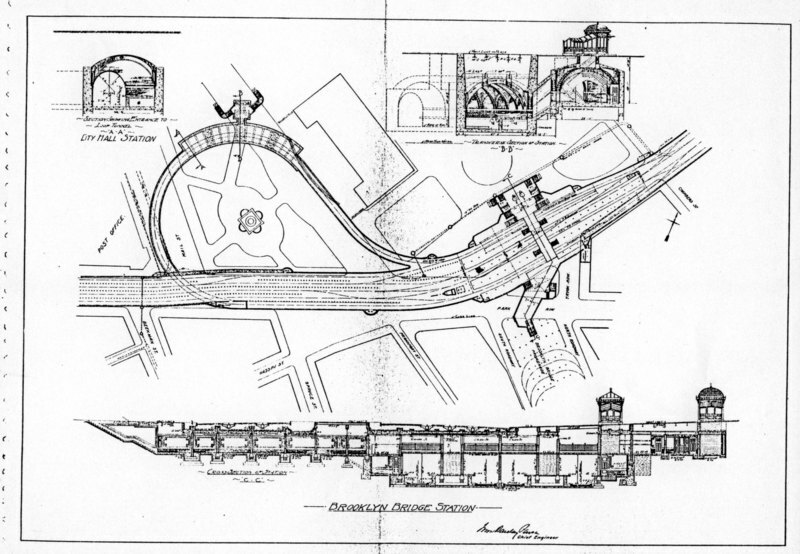 The curves at the south end proved impossible to rework so the station was lengthened northward (allowing Worth St. to be abandoned), and the curved southern ends of the express platforms closed. Gap fillers and original mosaic tiles remain in the closed ends. Worth Street Station was closed to passengers in 1962, due to the platform lengthening at Brooklyn Bridge. In fact, from 1962 to 1995, Brooklyn Bridge/City Hall was named Brooklyn Bridge/Worth Street on platform signs. This station underlies the sidewalk on the west side of Foley Square. The subway tunnel runs very close to the foundation wall of the lower level of Federal Plaza, but the station does not intrude into footprint of the plaza. Canal Street is a busy station in the vibrant Chinatown neighborhood. It is a local station with two side platforms alongside four tracks. Part of a large complex, transfer is provided here to the BMT Nassau St. and BMT Broadway subway lines. Due to platform lengthening in the 1950s, there are two distinct sections of this station. The original portion has tile covered I-beams with small name tablets and small "C" mosaics in tile band along tops of walls, and an ornamental ceiling. The new portion had 1950s green tile at the ends of the platforms, but a late 1990s-early 2000s renovation has replaced this with a uniform white tile along the whole platform wall. IND-type directional "To Canal Street" signs are also present. Some relative depths of stations in the Canal Street complex are as follows, +/- 10 feet. Local station with two side platforms alongside four tracks, and one center disused trackway. Fare control is at platform level, and the station was not designed with a pedestrian underpass between the platforms. The station retains the typical large and small IRT mosaics in the original portion. The portion of the station added during the various platform lengthening projects has simple white tile. The fifth center track, installed as part of the original construction and depicted in early publicity photos, is reported to have been disconnected by 1906. Its intended function is unclear. The locations of switches to and from this center track to the express tracks can be seen at one point along the center track walls. A mechanical room is now located in the trackway at the south end between the two express tracks. Plaques: Small "S" cartouches. Atlantic Terra Cotta, 1904. Name tablets: Two styles of mosaic tablet. Large original ones, Heins & LaFarge, 1904. Small ones not original. See photos below. Other: Small "S" mosaics in tile band along tops of walls. Bleecker Street station features typical IRT mosaics with two styles of small "Bleecker Street" mosaics. The fare control is at platform level. Until the full transfer to the IND 6th Avenue Line (at Broadway/Lafayette Street) opened in 2012, there was a very large offset between the platforms, and there was no crossover or crossunder. MTA New York City Transit hired a joint venture of Weidlinger Associates and Lee Harris Pomeroy Architects to design an ADA compliant, complete bidirectional transfer facility. Beginning in 2007, following the joint venture's engineering plans, the contractor, M.A. Angeliades, extended the uptown IRT platform 300 feet to align it with the IND station, and constructed a central stairwell and elevator shafts to connect the IRT platform to the IND platforms beneath it. Angeliades added elevators to provide access to Crosby and Houston Streets and an entrance at Mulberry Street. A new artwork entitled Hive, by artist Leo Villareal, is over the staircase leading to the uptown IRT platform. According to the blog at New York Writes Itself the artwork was inspired by John Conway's famous mathematical formula "Life". The LED lighting are programmed to flash with different speeds and intensity depending on how busy the station is. According to Sandra Bloodworth, the director of MTA Arts for Transit, the installation evokes not only the subway system's "movement and transportation, but also that process of life." The reconstructed and historically landmarked station is also graced with terra cotta finishes. The budget for creating the new transfer grew from $91 million to $135 million, in part because of increases in construction costs, and in part because the MTA learned it would have to relocate a water main at Houston Street and shore up an adjacent unstable building whose owners could not pay for repairs. The completion target of 2010 was pushed back repeatedly; the MTA finally confirmed that the transfer would be open in August 2012. Reconstruction of the station included repairs to all systems, reconstruction of control areas, and relocation of major buried utilities. Extension of the IRT uptown platform involved replacing the tunnel wall; constructing a new platform, roof, and tunnel duct manhole; and re-supporting the tunnel roof on the new platform roof. Excavation was necessary along an existing IRT tunnel box structure adjacent to an existing six-story building, garage, and giant billboard, which had foundations that had to be deepened and stabilized. Artwork Hive, Leo Villareal, 2012. "Kinetic" lighting installation in the transfer mezzanine on the uptown side. Local station with two offset side platforms alongside four tracks. The fare control is at platform level, and there are indications of a sealed-up crossunder, long since closed. The station's decoration includes plaques depicting beavers, in honor of John Jacob Astor, who had made his fortune in the beaver pelt trade. 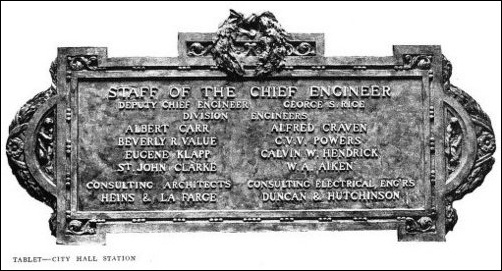 The beaver plaques and station name tablets are original decoration made by the Grueby Faience Co.
Astor Place station was built in large part under what had been private property along the west side of Astor Place. Several buildings were demolished to make way for the station accounting for today's odd shape of Astor Place. In the pedestrian island where the entry to the northbound station platform is located, there is a reproduction of the famous IRT kiosks. The heavy brick-faced square columns on the downtown platforms support the old John Wanamaker (now K-Mart) store above them. The octagon windows on the brick wall of the platform were the store's showcases. K-Mart has reopened a direct entrance to their store from the southbound platform, which had been sealed for many years after the demise of the Wanamaker's store at that location. Astor Place was planned to be a transfer point for the 9th Street branch of the Hudson & Manhattan Railroad (today's PATH). The H&M station would be at about the same level as the IRT on 9th Street between Broadway and Cooper Square abutting the west wall of the Astor Place station. The reservation for this branch is still in force as of the early 1980s; an apartment house on 9th Street was prevented from certain basement reconstruction because the work would compromise the right-of-way. Greenwich Village transit activists suggested building this spur to provide some cross-Village transit but by now it seems impractical and unlikely. Station diagram showing building lines. Click to enlarge. 14th Street/Union Square is an express station, with four tracks, two island platforms (in service), and two side platforms (abandoned). The uptown and downtown platforms are offset from each other north to south, and are slightly curved. Gap filling moveable platforms are automatically operated via proximity sensors mounted on the outside wall when trains arrive. There is a mezzanine above the platforms that provides transfer opportunity to the BMT lines. This station has two abandoned side local platforms. The northbound one is visible through windows, bordered with wide, bright red frames. The space is being used as storage and utility rooms. On August 29, 1991, an accident occurred just north of the station, killing five people in one of the worst wrecks since the Malbone Street Disaster of 1918. The train operator, Robert Ray, had been overshooting platforms on the entire run. At 14th Street the train was to be shifted to the local track due to repairs. He had been running the train at 40 MPH in a 10 MPH zone and took the switch so fast that only the front of the first car made the crossover. The third and fourth cars ended up perpendicular to the tracks, having sheared off support columns and split in half. The line suffered heavy damage and service was disrupted for six days as transit workers toiled around the clock to clean up the wreckage. The entire infrastructure, including signals, the switches, track, roadbed, cabling, and 23 support columns needed to be replaced. The motorman Ray was sentenced to 15 years in prison for the worst subway accident since 1928. The wreck occurred between 18th Street and Union Square on the downtown side at the entry to a former pocket track. Union Square and 72nd Street on the IRT West Side line had extra tracks on the approach to the station. These were between the incoming local and express track and were one old IRT train length long. The idea was to have a 'stacking' track where a train could be held momentarily until the platform cleared for it to enter the station. The track here and at 72nd Street were rendered useless when train lengths grew beyond their capacity. When the damage from the 1991 wreck was repaired the crossing was not made more gentle even though the stacking track here was removed. Local station with two side platforms alongside four tracks. The 18th Street station was open from 1904 to 1948, and was closed due to the platform lengthening project at 14th Street (you can see the 14th St. station just down the tracks). Postcard: "The Subway, 18th Street Station, New York". Collection of: Ed Levine. 23rd Street is a local station with two side platforms alongside four tracks. There are IND-type signs indicating the way to 22nd and 23rd Sts. An ornate fare control grille on the southbound side is actually an artwork entitled Long Division, by artist Valerie Jaudon, which was installed during station renovations in 1988. The station features a back-lit "23rd Street/Park Avenue South" sign at the platform-level fare control. There is a low tiled wall at the 22nd street end which is a probable remnant of a closed crossunder. 28th Street is a local station with two side platforms alongside four tracks. The local tracks are raised above the express tracks to facilitate easier braking and acceleration, as described in the book The New York Subway: Its Construction and Equipment (1904). The fare control is at platform level and does not currently provide for a crossunder or crossover, however there is a closed crossunder complete with railings and a blacked out sign indicating its location. The token booth is unusual in that instead of a standalone structure, it is built into the tile wall. The station's ornamentation includes an unusual back-lit station name sign at the fare control. Original station plan. Click to enlarge. 33rd Street is a local station with two side platforms alongside four tracks. The local tracks are raised above the express tracks to facilitate easier braking and acceleration, as described in the book The New York Subway: Its Construction and Equipment (1904). The fare control is at platform level. The decoration at platform level features terra-cotta eagle plaques, similar to those at Brooklyn Bridge and 14th Street. This station was recently renovated. Artwork Lariat Seat Loops, James Garvey. Also at Wall Street (see above). Diagram of the "Diagonal Station". Click to enlarge. Grand Central is an express stop and the first station along the line from Brooklyn Bridge built as part of the Dual Contracts. During its construction it was referred to as the "Diagonal Station", owing to its position on a diagonal connecting the IRT Contract I subway under Park Avenue with the new Dual Contracts subway under Lexington Avenue. (Since then, the subway south of Grand Central has come to be known as the "Lex" even though it runs under Park Avenue and various other thoroughfares.) The station is roughly positioned beginning at 41st Street & Park, running under the buildings along 42nd Street between Park & Lexington, and ending just north of 42nd Street at the west side of Lexington. A December, 1918 article published in the Public Service Record, Design of the Diagonal Station and Connection, details the construction, and a later single line diagram gives a scale representation of the track and platform layout. The station platforms are decorated with what will be recognized as "typical Dual Contracts" name tablets, icons, and "runner" mosaics along the track-side walls. The icon in this case is a stylized steam locomotive, apropos to the station's location under Grand Central Terminal (which in its early days indeed had steam powered trains). MTA Metro-North's renovations of Grand Central Terminal included an air-conditioning project, and this was extended to the usually extremely warm IRT subway platforms. Chilled water-based air coolers are located at several points along the platforms, making Grand Central the only artificially cooled station on the New York City Subway. The platform's massive columns and beams support part of Grand Central Terminal and the office towers next to it. The station offers transfer to the IRT Flushing, Queens line as well as the Shuttle to Times Square. The complex also included provisions for a terminal station serving a future extension of the Hudson & Manhattan (PATH) railroad's 6th Avenue line, planned in the early part of the century but never constructed. As a result the station is extremely complex, with a mezzanine above the IRT Lexington line platforms which has direct access by escalator to the Flushing line. There is also a cross-under below the Lexington line platforms offering an easier transfer path to the Flushing line. The mezzanine features as artwork a correctly-oriented compass rose inlaid on the floor. The Grand Central complex is home of the master tower which controls the entire East Side IRT. from lower Manhattan to 125th Street. The interlocking control is quite a sight. The board board shows the status of all of the signals and switches, and roughly indicates the train locations along the East Side IRT. In the photo of the board below, the City Hall loop is on the top track diagram on the far left, and at the close right is Grand Central. The lower tracks indicate from Grand Central north to 125th Street. North of Grand Central, the express tracks descend to a lower level, and the line continues north in a 2-over-2 configuration. 51st Street a local station with two side platforms alongside two tracks (the express tracks are on a lower level). It is the sixth busiest station in the subway system. This station features beige brick over the original tile but the standard IRT mosaics were saved. There is a crossunder at the north end and connections via a long passageway to the IND Queens Boulevard/53rd Street line station at Lexington Ave. The fare control is seven steps up from the platform level, and the platforms themselves are approximately 60 feet below street level. 59th Street is an express station with two levels each with two side plaforms alongside two tracks. It was built as a local-only station with side platforms (now the upper level). The express tracks, which run underneath the BMT 60th St. tunnel, had platforms added later and were opened on November 15, 1962. The express platforms were added to reduce congestion at Grand Central and to provide another connection to Queens trains via the BMT. This complex is on three levels, with the IRT local on top, the BMT Queens trains in the middle, and the IRT express on the bottom. This station used to have all green tile which has been covered up except for one "59th Street" sign near the south end of the northbound platform. There are whimsical stylized coffee cups and slippers mosaics in varied colors at random spacing near the stairways to mid and upper levels. 68th Street/Hunter College is a local station with two side platforms alongside two tracks. The platforms feature original Dual Contracts mosaic tiling, with "68" tablets and name tablets reading "68th STREET-HUNTER COLLEGE". At the ends of the platforms, the tiling is different where the station was extended in the 1950s. The stairs leading to the mezzanine are near the south end. The mezzanine was renovated in the 1990s and has stainless steel fare control rails, a glass-windowed crossover/waiting area, and red accent stripe in the tiling. The northern half of the station without the mezzanine has very high ceilings. 77th Street/Lenox Hill Hospital is a local station with two side platforms alongside two tracks. The fare control is ten steps up from the platform level, and does not provide a crossover or crossunder. Some old wall lights exists but most are gone or in disrepair. Emergency exits from the lower level express tracks are on both platforms. 86th Street is an express station with two levels, each with two side platforms alongside two tracks. The station has its fare control at platform level, with no free crossover/under provided. The station was renovated in the 1990s and mosaic artwork was installed in the stairways. This station serves the surrounding neighborhood known as Yorkville, which once had a large German-American community. The area has changed and the ethnic stores are gone, but once a year, the past returns during the annual Steuben Day Parade. 96th Street has a crossover and a mosaic in the mezzanine entitled City Suite, commissioned in 1994. New "96th Street" mosaics abound and a window in the mezzanine overlooks the tracks, giving a view of oncoming trains from the south. The south end of the station features a rounded ceiling due to problems encountered during construction. 103rd Street is a local station with two side platforms alongside four tracks, the express having risen from the lower level. The station has a mezzanine crossover and is renovated. The featured art work is a 1990 ceramic entitled Neo-Boriken by artist Nitza Tufino. Mosaics indicating uptown and downtown directions are also here. 110th Street is a local station with two side platforms alongside four tracks. Fare control at platform level and no crossover or crossunder is provided. There are standard IRT number and station name tile mosaics. 116th Street is a local station with two side platforms alongside two tracks. (Between 110th St. and 116th St., the express tracks descend back to the lower level.) Fare control is at platform level and no crossover or crossunder is provided. This station has the standard IRT number and station name tile mosaics. 125th Street is an express station on two levels, with two island platforms and four tracks, however the platforms are not arranged in typical express-on-one-level, local-on-the-other fashion. Here, the upper platform has express on the east track and local on the west track, and the lower level is opposite. This is done to easily separate traffic bound for the branch lines in the Bronx. There is an active tower at the north end of the northbound platform.